Heat oven to 350°F. Generously grease 12-cup fluted tube cake pan with shortening, or spray with cooking spray. In small bowl, mix melted butter, dill weed and garlic powder. Separate each can of dough into 5 biscuits; cut each biscuit into fourths. Coat half of the biscuit pieces in butter mixture; arrange in pan. Sprinkle 2 cups of the cheese over dough. Coat remaining dough pieces in butter mixture; place over cheese. Sprinkle with remaining cheese. Bake 30 to 35 minutes or until golden brown. Let stand 5 minutes. Run knife around outside edge to loosen. Place heatproof plate upside down over pan; turn plate and pan over. Remove pan; invert onto serving plate. 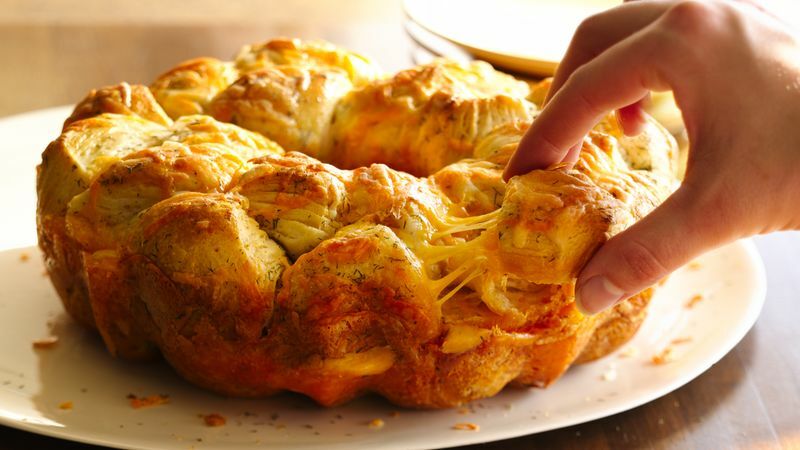 Pull apart to serve. A pizza cutter works great to cut the biscuits into quarters super-fast!